On September 4, 1861, 69 men, including Captain Ashbel Green were mustered into military service at Pass Christian. Three enrolled at New Orleans and joined the Pass Christian contingency within a few days. They made up the Dahlgren Guards Company, which was part of the Third Mississippi Infantry "C" Regiment, commanded by Col. John Deason. The Pass Christian Dahlgren Guards was headed by Lt. Col. Thomas A. Mellon during their encampment at Camp Tugville, which was located two miles northeast of the Pass near the intersection of White Rock Road and Pass Road. In the early months of 1862, the women of the Pass raised their spirits by creating a flag that represented their love for their men, devotion for their sovereign state, and dedication to the war effort. The flag was an adaptation of the official flag of the Sovereign Republic of Mississippi. In 1810, the Bonnie Blue Flag with a White Lone Star had once waved for 74 days when Pass Christian was part of The Republic of West Florida. With that flag in mind, the Sovereign Republic of Mississippi adapted The Magnolia Flag on January 26, 1861, with the Lone Star in a Bonnie Blue canton corner, and a Magnolia Tree in the center of a white background. 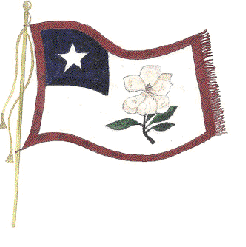 The modified Pass Christian Flag had a large Magnolia Blossom centered in the white background with the Bonnie Blue canton and Lone Star. The Dahlgren Guards presented it as the Regimental Flag for the Third Mississippi Regiment, but it was lost by mishap during its first confrontation with the enemy. Following a pressed march with full packs from the Pass toward Handsboro, upon reaching the Long beach area, the tired troops were apprised of the Federal bombardment of the Pass Christian harbor. Immediately, they reversed their march to return to protect the Pass. Comprised of only 165 men, the 3 Confederate companies were engaged by the "9th Connecticut" numbering 500 refreshed men supported by artillery fire. The Rebels bravely fought for an hour, but were forced to evacuate their positions. The decorative regimental flag was still encased in its sheathe in the Headquarter's tent at Camp Tugville where the Yankees found it. On April 4th, 1862, the coastal volunteers were routed in defeat against insurmountable odds. The Pass Christian Flag was paraded through the streets and was misrepresented as a captured Confederate "Battle Flag". Following the War, it was returned on Connecticut Day at the New Orleans Exposition on February 26, 1885, and is currently housed at Beauvoir. "In behalf of the surviving members of our command, as captain of the Dahlgren Guards, of Pass Christian, Mississippi, it is with sincere pleasure that I receive the flag captured by you from them at Pass Christian on April 4, 1862." "This day, sir, recalls another day and another presentation. It was a proud day for us, when full of patriotic ardor, we first received this flag, the work and gift of the fair hands of the ladies of the Pass, our kindred, friends, and neighbors." "In returning it, you show a spirit which does you honor, and to which we heartily respond. Brave men respect the brave and, the war is over, we are ready to pursue the paths of peace." According to later reportings by Lt. Col. Mellon, the Flag had been left in camp unfoiled and that it had been taken from the abandoned camp and not lost in battle. (Note: The Pass Christian Flag was then stored in a box and kept at the Mississippi State Department of Archives and History, where many years later, was converted to the custodianship at "Beauvoir." The magnolia blossom has completely deteriorated due to the heavily painted leaves becoming fragmented. In 1987, when Billy Bourdin found out that the Pass Christian Flag was being brought back to the Coast to be stored at Beauvoir – he began pressing anyone and everyone who would listen, to do something to reconstitute the Pass Christian Flag. Everyone agreed that the idea was good. Billy asked artist Tazewell to paint him a replica which displayed prior to Hurricane Katrina from his Davis Avenue balcony for all "Passians" to see. Dan Ellis researched the flag’s history and wrote the “Flag Book” for the 1999 Tricentennial celebrations. Jessie Heitzmann incorporated the Magnolia blossom in her logo design for the Tricentennial. Homer Jenkins replicated the Flag on Coffee cups. John Lutenbacher presented the idea to the Historical Society and the flag was reproduced and mounted on one of the walls of the Historical Society Building. Dayton Robinson had a smaller facsimile made for the Historical Society to show on special occasions. Aldermen Joe Piernas and Anthony Hall, while attending a Coast Conference, found that all other coastal cities had their own flag, so they went to work and encouraged the City Council to adopt the Flag as the Official Flag of Pass Christian and to have it displayed at the 2005 Mississippi League Annual Convention. Since Hurricane Katrina, the Pass Christian Friendship Flag has flown at Billy Bourdin’s gallery.